Steve is from a family of singers and concertina players going back to the 1890's. 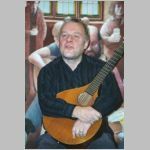 He has a fine store of songs and is one of the most highly rated concertina players in the British Isles. Come and be mesmerised by his easy style. His CD “The Whirligig of Time” was released to great critical acclaim.